Easy, simple and fast installation with the FIX-R EPDM membrane and accessories. FIX-R EPDM roofing membranes have a life expectancy of 50 years. Manufactured by the largest EPDM manufacturer in the world. Half a Century track record of performance and durability. These professional grade membranes are available in 1.20mm and 1.50mm thicknesses. All available as whole roll items on 3m cores or in a cut to size format to suit your requirements. Available in 3.05, 4.57, 6.10, 7.63 & 9.15m wide by 30.5m long. 1.20mm & 1.50mm thick sheets. This high strength, solvent based bonding adhesive, specifically designed and manufactured for flat roofing installations. Perfect for onding FIX-R EPDM Membrane to horizontal and vertical services. Suitable for a range of surfaces e.g. timber, brickwork, metal, PVC and concrete. Available in 1L (1.5 – 2m2 coverage) and 5L (8 – 10m2 coverage). A High Strength, solvent based bonding adhesive, specifically designed and manufactured for flat roofing installations. Perfect for bonding FIX-R EPDM Membrane to horizontal and vertical surfaces. Suitable for a range of surfaces e.g. timber, brickwork, metal, PVC, and concrete. Available in 1L (1.5 – 2m2 coverage), 2.5L (4 – 5 m2 coverage) and 5L (8 – 10m2 coverage). Designed to be roller applied to the substrate and sheet backing. For full usage details refer to FIX-R Intsallation Guide. 152mm PS Cover Strip, 228mm PS Uncured Flashing, PS Pipe Seals and PS Walkway Pads.. Available in 0.5L and 1L containers. For application details refer to FIX-R Installation Guide..
FIX-R PS Secure Tape manufactured to precise width and thickness criteria with a clear poly backing for easier on site application. FIX-R seam tape offers over 30% greater peel and sheer strength when compared to market rivals. This tape is designed for use with FIX-R EPDM roofing systems to fuse the EPDM Membranes together resulting in long term seam strength. For application details refer to FIX-R Installation Guide. FIX-R 152mm PS Cover Strip is used for stripping in metal edging, drip edges, gravel stops and fastening plates. This tape consists of a 1.02mm semi cured EPDM strip laminated to a 0.89mm fully cured synthetic rubber based pressure sensitive adhesive..
152mm by 30.5m long rolls. Resists tearing, cracking and abrasion in all weather conditions. Can be used when seaming with 76mm PS Secure Tape is not possible. Must be used with FIX-R EPDM Primer. For full usage details refer to the FIX-R Installation Guide. FIX-R PS Uncured Flashing Tape is easily moulded and highly adaptable to irregular shapes and surfaces. This self-curing tape is ideal for flashing and waterproofing of roof details such as pipes, corners, outlets and other penetrations. 228mm wide by 15.25m long rolls. Easily adaptable to irregular shapes and surfaces. Easy application with clear poly backing. FIX-R EPDM PS Pipe Seals are available in two sizes – small 12.5 – 76mm and large 25 – 152mm in diameter. FIX-R EPDM Pipe Seals are cured, pre-moulded EPDM Flashings for round flat roof penetrations, with pre-applied secure tape to the base and a stainless steel clamping ring. Pre-applied Secure Tape on the base of the pipe seal gives fast and simple application. Ribbed collar for accurate cutting to pipe size. In common with most single ply material, EPDM will over time try and shrink by up to 10% back to the centre. The base tie-in controls the membrane movement and stops the membrane pulling away where the membrane turns up through an angle change. The rest of the movement is accommodated by the FIX-R Membrane and its ability to elongate by over 300%. FIX-R PS RUSS (Reinforced Universal Secure Strip) is used to mechanically secure EPDM Membranes to the substrate. The strip has tape pre-applied along one edge and can be installed horizontally or vertically in conjunction with Seam Fastening Plates below the EPDM Membrane for additional membrane securement. Ideal for additional membrane securement as needed..
Used with FIX-R RUSS Strip to securely clamp the RUSS to the vertical or horizontal surface. Must be used in conjunction with the appropriate fasteners for the substrate. r creating a finishing edge. An economical, but high quality finish to the roof perimeter. 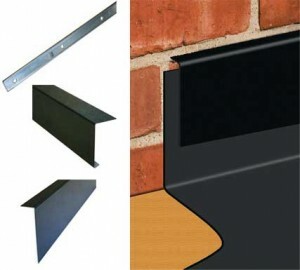 Available as 100mm wall flashing and 75 – 175mm deep perimeter trim. The wall trims offer an economical alternative to lead and are not susceptible to theft. Each trim is 3 metres long, fixed in to the wall with RB fasteners. Perimeter trims feature a drip return on the bottom, with a range of sizes available. Termination Bars are used to create a compression seal to upstands where cutting a chase or to neighbouring roof systems. 3 metre lengths for efficient installation..
Clean, simple finish to the flat roofing system..
An alternative to using the Plastisol Trims, the benefit of these is that they create their own seal to the roof surface, negating the need to install a timber perimeter upstand. The drip edge is a two part trim that clamps the membrane into place and creates a step into the gutter at the same time. The drip edge can also be used in conjunction with the Plastisol Edge Trims. PVC Trims are supplied with jointing clips, polypins and internal and external corners are available. Fast, clean, simple finish to the flat roofing system.